Do you have heart disease? Chocolate can’t help, can it? If you’re a sweet tooth, you can never go wrong with a delectable piece of chocolate after a long day of work or school. This is considered a comfort food and a go-to pick-me-upper for those tough days when you need a fix. Did you know that chocolate can do more for you than just that? Read on to learn more about the wonders of this all-time favorite. This sweet treat is endowed with substances that protect you from numerous heart problems. Chocolate is rich in antioxidants. This is especially true for the dark variety. 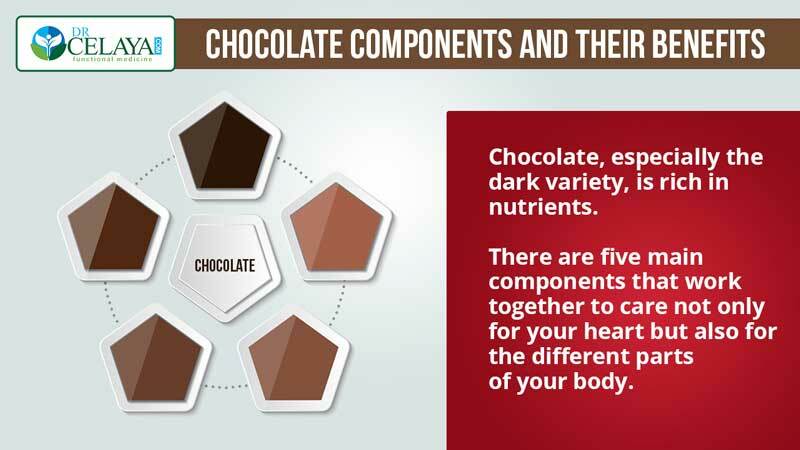 There are five main chocolate components that can provide you with benefits not only for your heart but also for different parts of your body. 1) Abundance in flavonoids gives protection from free radicals that can be acquired from contaminants like cigarette smoke. This also helps lower the body’s bad cholesterol significantly. Aside from lowering the risks of having heart problems, flavonoids decrease the risk of having cancer and reduce the inflammation on different parts of the body. 2) Flavanols are the main kinds of flavonoids in chocolate and cocoa. Like flavonoids, this is also rich in antioxidants that help improve your immune system functions. Also, this component promotes your blood vessels’ health. As a result, you will have better blood clotting time, good blood platelet consistency, improved blood flow to the heart and brain, and normalized blood pressure. 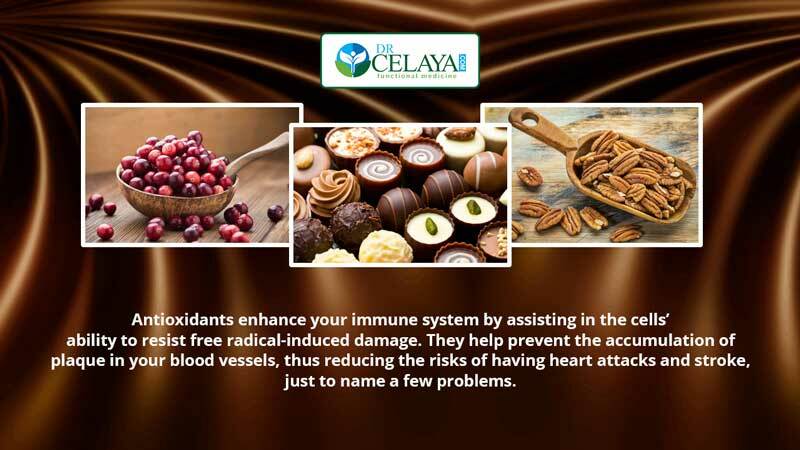 3) Antioxidants enhance your immune system by assisting in the cell’s ability to resist free radical-induced damage. Lack of antioxidants in your body encourages your systems to accumulate plaque on the inner walls of your blood vessels. When left untreated, the plaque will eventually block the entire inner part of the blood vessel. This, in turn, results in problems like heart attacks and stroke, just to name a few. 4) Resveratrol is a type of polyphenol that’s been famous in the nutritional supplement realm lately. This promotes both cardiac and non-cardiac muscle condition by preventing muscle wasting due to cancer and diabetes. Aside from that, this component helps improve mental function and your oral health. 5) Cacao indirectly helps care for your heart by somewhat dealing with your depressive states. Cacao “tinkers” with the brain by making sure your serotonin and dopamine are at their optimal levels. Serotonin and dopamine are two of the brain chemicals that help preserve your feelings of happiness and overall well-being. Interestingly, cacao in chocolate does this in a similar manner as that of prescribed antidepressants. Chocolate is sweet and “fatty.” Should I be concerned? Yes, chocolate is both sweet and fat-laden. However, the monounsaturated fat you find in chocolate comes from plants, which is healthier than processed fats. Oleic acid is an example of healthy fat that you can find in chocolate. This fatty acid and other elements of plant fat help improve your immune system and major brain functions. Even if chocolate contains saturated fat, the average 3 grams per serving is a lot lower than anything that can cause problems. In fact, saturated fat can facilitate lowering the bad cholesterol in your body. Aside from preventing heart attacks due to blood vessel blockage, this can help regulate the blood sugar in your body, if you consume chocolate in moderation. There are lots of studies that can attest to the benefits of chocolate for major heart functions. In a literature review I authored (article abstract), I concluded that, yes, cacao beans used to make your favorite bars of happiness indeed help in significantly reducing the risks of acquiring heart-related problems. Aside from that, the participants of the studies that I analyzed in this review showed significant improvements in blood vessel flexibility and anti-inflammatory effects. Furthermore, these benefits are amplified when antioxidant-rich ingredients like soluble fiber, hazelnut cream, and cocoa cream are mixed with chocolate. A Harvard-based study concurred with my findings. They concluded that moderate amounts of chocolate can help improve the contraction of the heart muscle, thus preventing problems like atrial fibrillation by as much as 20%. The study recommended consuming around 2 to 6 servings of chocolate in a week. The study suggested that consuming less than that amount will not do anything to decrease the risks of having a fibrillation. Are you ready to get to the main issues of cardiovascular issues? You can schedule a FREE 15 minute consultation with Dr. Celaya. A Danish study analyzed the health conditions, current lifestyle, and eating habits of more than 50,000 men and women. The researchers found out that regular chocolate consumption significantly lowered the risks of acquiring atrial fibrillation by as much as 20%. This has been applicable to respondents who ate around 2 to 6 servings of dark chocolate every week. Yet another descriptive study agrees with these findings. 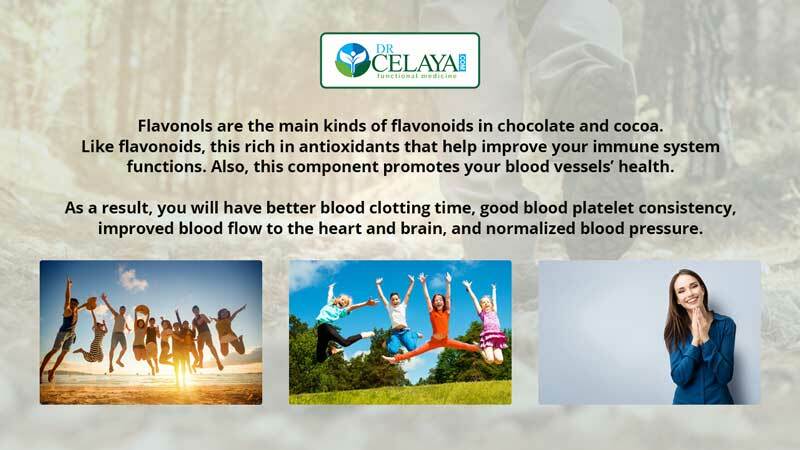 Aside from flavonols, the investigators believe that substances like anthocyanidins and isoflavones further aid in promoting circulatory system health for patients who received around 100 grams of chocolate a day for 15 days. While chocolate can undoubtedly help provide better cardiac health, you should still take it easy with the portions. Also, just because chocolate is good for the heart doesn’t mean that all types of chocolate are helpful. Experts recommend going for the dark chocolate types if you want to have a heart-healthy fix. As much as possible, consume the ones with the least amount of dairy and sugary ingredients in it for the best results. A serving or two of dark chocolate a day is the recommended portion for this dessert. Anything more than that will just contribute to an accumulation of unnecessary calories. When your body stores too many calories that are never used for physical activities like exercise, you will eventually gain weight. If you’d like to know more about your health, you can schedule to become a new patient or a free consultation.